HONOLULU -- President Barack Obama says it has been “the privilege of my life” to serve as the commander in chief of the U.S. military. Mr. Obama and first lady Michelle Obama are visiting U.S. troops at Marine Corps Base Hawaii in Oahu’s Kaneohe Bay. It’s the last time Mr. Obama will take part in his annual Christmas tradition as president. Mr. Obama says his gratitude to the military won’t stop once his term ends. He says his commitment to standing by the military “every step of the way” continues. The president is noting that U.S. troops are serving on Christmas in dangerous places like Iraq and Afghanistan, with some engaged in missions against the Islamic State of Iraq and Syria (ISIS). He says they should know that Americans understand that they serve every day to protect U.S. freedoms. President Obama spent Christmas Eve working out at the gym, stopping for shave ice and participating in a live-action escape game with his daughters during their vacation in Hawaii. The president brought his daughters, Malia and Sasha, and friends to a place called Breakout Waikiki where they had an hour to “crack the codes” and “use your gut” to break out of an escape room. Meanwhile, first lady Michelle Obama spent Christmas Eve surprising kids across the U.S. with a phone call. “I want to hear Santa talk,” said Austin, one of a handful of kids who called the NORAD Tracks Santa program on Saturday and found Michelle Obama on the other end of the line. 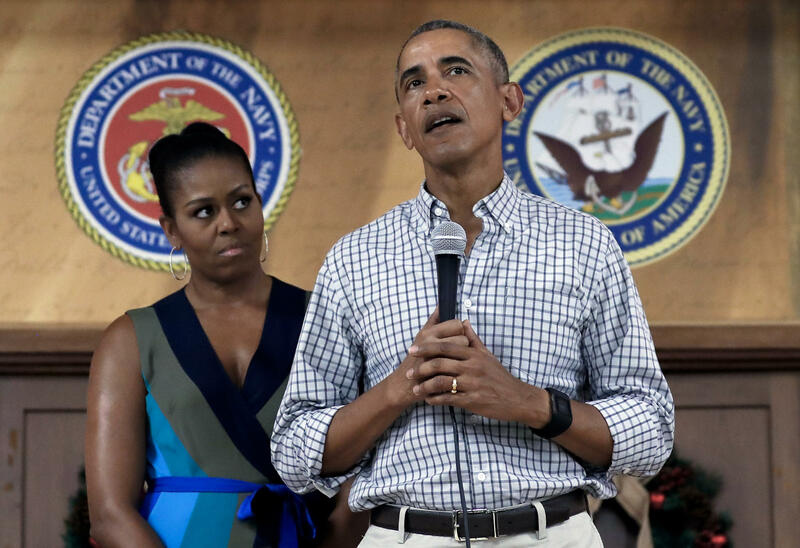 Santa couldn’t get to the phone, the first lady patiently explained, “because he’s delivering all the gifts” — 3 million of them and counting, according to NORAD, as of late morning in Honolulu, where President Barack Obama and his family are on vacation. There was a bittersweet note this year as the first lady carried out her annual Christmas ritual for the final time, taking calls from kids who wanted to know exactly how much progress Santa had made on his journey. It’ll be up to the next first lady, Melania Trump, to decide next year whether to continue the tradition. But Austin had another concern in mind: Would Santa know where to go? “I’m going to move to another house,” said Austin, joined by three other kids in North Carolina. No matter, Mrs. Obama replied. The first lady spent roughly a half-hour taking calls before joining her husband, daughters Sasha and Malia and family friends for lunch at Side Street Inn, whose greasy food and low-key atmosphere is popular among Hawaii locals and tourists alike. Then the family drove to Breakout Waikiki, a “live action” experience where visitors are “trapped” in a room and must work together to break out. But before the family fun, there was a geography lesson as the first lady updated children about Santa’s most recent locales on his gift-giving voyage: Sardinia, Malta and Hungary, to name a few. If there was a lesson for the first lady, it was a crash course in the latest hot-item gifts. A girl named Kirsten told Mrs. Obama she wanted a drone from Santa. Joshua wanted a Hot Wheels garage, while Aiden wanted a hoverboard. But it was Adilyn whose gift seemed to catch the first lady off guard. “I’m getting a hedgehog tomorrow,” Adilyn said.